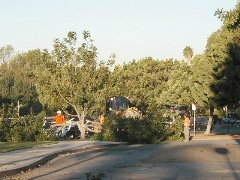 (January 17, 2003) -- Shortly after dawn today, chainsaws and bulldozers met old growth trees at Scherer Park...and the saws and bulldozers won. 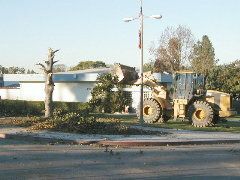 City Hall began cutting down and removing trees from the park's corner of Atlantic Ave. and Del Amo Blvd. as part of its plan to expand the North Division police facility. 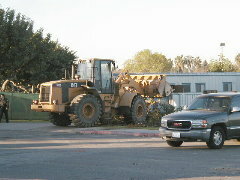 After chain saws ripped off tree branches, a bulldozer scooped up the remains as so much garbage. The action marks the end to a marathon effort by park protection advocates, led by Friends of Scherer Park founders Gigi & Reggie Bannister who founded a separate group, Stop Taking Our Parks, who tried to prevent City Hall from taking further park land for non-park "institutional" purposes. The Bannisters and park protection advocates ran into walls of opposition. The Scherer Park police facility expansion was backed by a number of influential 8th and 9th district community members, 8-1 Council votes (Grabinski dissenting), political diversions (Council refusal to put a Charter Amendment protecting parkland on the ballot; Grabinski floating a "parks in perpetuity" plan that wouldn't protect parks from future Council takings), LB school district interference (removing the former Dooleys Hardware site as a potential alternative) and Superior Court and Court of Appeals rulings letting the City Council (absent other city law) do what it did. The final blow came just weeks ago with a National Park Service decision (previously reported by LBReport.com) concluding that removing roughly two acres of Scherer Park land (to be "replaced" by new parkland on 55th Way) would not create any long-term significant adverse impacts.